Marty enthused about this and he was right to do so. Typical of the style to the eyes but its the other senses which really luck out with this beer. The sweet damp fruity (banana-ish) nose and core is beautifully dominant and is well supported by a supple but concentrated core which goes the distance. Gloss and silk on the way down too. Easily the most authentic and deep American made Belgian PAle Ale I've tried. Tip top. Nanner, nanner, nanner... A bananna smoothie does taste this fruity. Pours slightly opaque with a head that disappears as fast as a freshman coed's bra. Strong bananna taste overpowerers everything else. No bite. Marginal aroma. That same coed mentioned before would probably love it. Sorry boys, it's just not my type of beer. Glad I ordered a "shorty." BOTG# 29! I'm an animal! 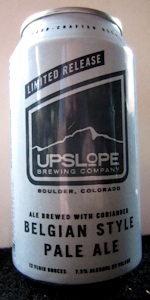 Thanks to Courtney at Crafting a Nation for this one- my first every Upslope beer. Poured from can into Brooklyn tulip. Pours a super cloudy orange color. Cant see through it at all. Not much head on this. Looks nice though. Smell- coriander, cream, this smells like dreamcicle popsicles! Some vanilla as well. Taste- huge orange presence, nice hop bitterness on the back on the throat. Borders on being overly sweet, but the vanilla and coriander flavors come back together. For 7.5% this is amazingly drinkable. Nice mouthfeel. Overall, I could see this being a sneaky high abv alternative during the summer months. Well done. always love trying new upslope stuff. this one pours a very very cloudy orange to amber color with a nearly 2 inch white head. smells like belgian yeast, pale english malts, and mellow but flavorful hops. flavor is surprisingly sweet from the turbinado sugar. that wasnt detectable in the smell, but man this whole beer has a sweetness to it from start to finish, not overpowering, but always present. yeast mixes nicely with the hops. this isnt a belgian pale ale in the sense of like a petrus or even some of the new belgium products, but it is a cool take. feel isnt bad, a little sugary on the teeth, but a good medium body and appropriate carbonation. overall a very drinkable 6pack, and at 7.5% its good bang for the buck as well. I could see how this one wouldn't be for everyone. It's basically a beafy Wit (meaning it has some sweetness you wouldn't expect). A: Beautiful hazy orange, exactly what I was hoping for. The head dissipates too quickly. S: Lots of belgian trappist yeast in the nose, followed by coriander and hops. Great! T: Hit with some funk up front, then comes some serious sweetness/sugar, followed by a slight hoppy kick and more yeast. It took nearly a full can to pin down the flavors: Slight banana, coriander, citrus, along with the ever present belgian yeast. There's some nutty malt flavors going on as well. Wow, this is good. M: Slightly hot. It's got great carbonation, nice and milky smooth. O: This is an excellent beer that I will likely purchase far more of in the future. Crazy drinkable and the ABV sneaks up on you. Belgian ale fans- seek it out!